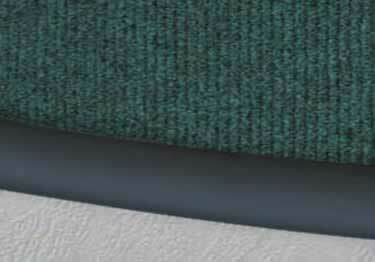 Roppe Rubber Carpet Edging provides the perfect transition for carpet flooring. Available in 30 colors to compliment your interior design. Can this curve or make a circle? How does the rubber edging fasten to the carpet? I can't find any info in specs for my husband. We need to know before we buy. Thank your your review. We very much appreciate your feedback about our great product and pricing. Bought this product to edge my carpet tile installation. It worked perfectly. Thank you for your review. We are glad this product worked perfectly for your application. If there's ever anything we can do to help in the future. Please don't hesitate to give us a call. The rubber edging seems to be more rugged. I installed the vinyl version of this carpet edging and had some of it split where the top meets the leg that extends under the flooring. This is in a commercial environment, a gym where there was a bit of traffic. Professional transition from carpet flooring to resilient, ceramic or wood flooring. Five profiles, 39 colors, 12 ft strips.